Sure, Zip Cars can be convenient for getting around town, but what if you want your carbon footprint to be so small it can't even push down the accelerator on a Prius? 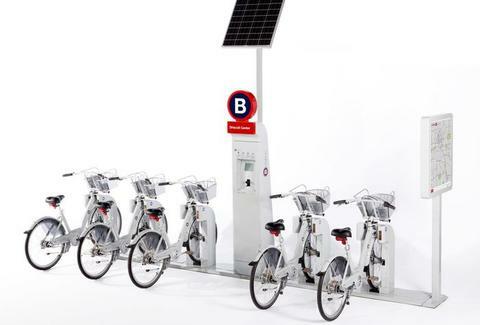 Then flip the whip for a bike, with B-Cycle. Set up like a certain car-share service for pedal-mobiles, B's setting up stations across cities that'll grant you access to a two-wheeler whenever you want, and not just because someone left it unlocked outside the bar, and it's freezing, and you're in college so what the hell's anyone going to do about it. Pick a membership option (24-hr to yearly) and B'll mail you a universal swipe card that'll unlock a ride, or just show up and rent on-site; once you've used, drop it off at any station you want, then get out of those spandex riding pants or risk undue attention for a suspicious package. The GPS-enabled cruiser-style bikes've been specially designed by Trek, and include proprietary tech to log data on your account page, from the length/duration of each ride, to your carbon offset, to how many calories you've burned riding/sweating that your friends will see you on a bike. B debuts in Denver, but's polling visitors to determine the next location, so cast your vote or if they skip your 'burg you'll have no right to get Huffy.